You've heard the names of these ancient Gods before, but now you can come face-to-face with the powerful deities of history's most infamous pantheon. Your destiny sits in the lap of the Gods as you take a voyage into the unknown, attempting to conquer the foes of myth and legend. The world of Ancient Greek mythology, of classical Gods and monsters, provides a striking backdrop to this feature-rich Slot game. Figures such as Zeus, Athena, Poseidon and Hercules appear on the reels in order to help us mere mortals shape our fates and fortunes, while one other figure - that of the ever-growing Progressive Jackpot amounts - is sure to attract attention all on its own! And yes, we said ‘jackpot amounts’, because this Slot has no fewer than four Progressive Jackpots! They range in size, from the Power Jackpot (the smallest), the Extra Power Jackpot, the Super Power Jackpot and the Ultimate Power Jackpot (the largest). And the largest jackpots are not reserved for the big spenders: if you make it to a jackpot round, you WILL win a jackpot, and which one you win will be in your own hands. The Jackpot Game screen shows you 20 coins, face-down. Turn them over one at a time until you have three matching symbols - the symbol will determine which jackpot you win. But do you know the most amazing thing about the Jackpot Game? It’s triggered perfectly randomly! That’s right - even a losing spin can result in a trip to the Jackpot Game and a guaranteed win, making every spin count! Turning over and matching symbols also lies at the heart of the Age of the Gods™ Bonus. Pick an icon, one at a time, until you have matched three symbols of Zeus, Athena, Poseidon or Hercules. Match three Zeus symbols to play Zeus Free Games, with an extra wild symbol and a win multiplier that grows with every third spin. Match three Athena symbols to play Athena Free Games, where the goddess will grant you a random win multiplier between 2x and 5x. Match three Poseidon symbols to play Poseidon Free Games, with up to five extra wilds. Match three Hercules symbols to play Hercules Free Games, with the strongman himself appearing as a stacked wild filling the entire third reel. When each of these free games ends, you’ll find yourself back at the Age of the Gods™ Bonus round, with the chance to launch yet another Free Games round. With a wealth of ways to win and the potential to hit a Progressive Jackpot with every single spin, Age of the Gods™ is a truly epic Slot! The maximum win from a single spin in the base game is 250,000 coins. Or, win one of the four – Power, Extra Power, Super Power or Ultimate Power – Progressive Jackpots, which all vary and grow in size. Overall Opinions: Who Should Play the Age of the Gods™ Slot? Age of the Gods™ is, like the rolling hills and wine-dark seas of Ancient Greece, well worth exploring. Not only does it boast some of the best graphics and visual animations of any Progressive Jackpot Slot, but the numerous bonus features and multi-level jackpot rounds are sure to appeal to all fans of Slots games. Don't worry, though – this game isn't just for history or theology buffs! While this game will definitely appeal to online Slots players with an interest in fantasy or action-adventure books and movies, as well as those with a passing interest in Classics, it's for everyone. The game brings the medium of video Slots to life in a great way. The modern Casino player will love this game for its innovative play and multiple ways to score a big win. 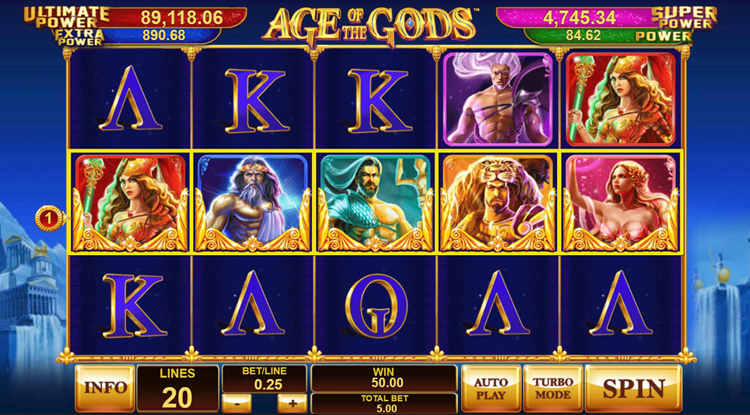 If you like this fantastically popular Slot, then you’ll love the complete collection of Age of the Gods™ Slots! Check out Age of the Gods™: Prince of Olympus, Age of the Gods™: King of Olympus and Age of the Gods™: Furious 4! Did you know you can play Age of the Gods™ for real money, or try it for free with our play money version – click here to choose which version you want to play.